This style board is a look I am planning to wear this spring/summer. (You may remember I did a very similar board in the winter that included leopard.) All I need to do is find a red bag and some red shoes. I have been shopping for a new red bag - and I am trying to decide if I should splurge or save. Since I may only use it occasionally I will probably opt for a cheaper option, but I really like this small satchel. Also, I am shopping for some red shoes - either sandals or pumps - and possibly some espadrilles. I like these splurge ones a lot - but they are out of my price range. I have also been shopping for some lace up tops, which I believe are going to be a really big trend this season. I recently purchased this lace up sweater - during the Express sale (thanks to the heads up from Gina). I also ordered this one from Asos. I will let you know which one I decide to keep. And, I am continuing my Thursday "which BLOGGER WORE which shoes" game. Can you guess which blogger wore these shoes? Check back tomorrow (Friday) to find out. 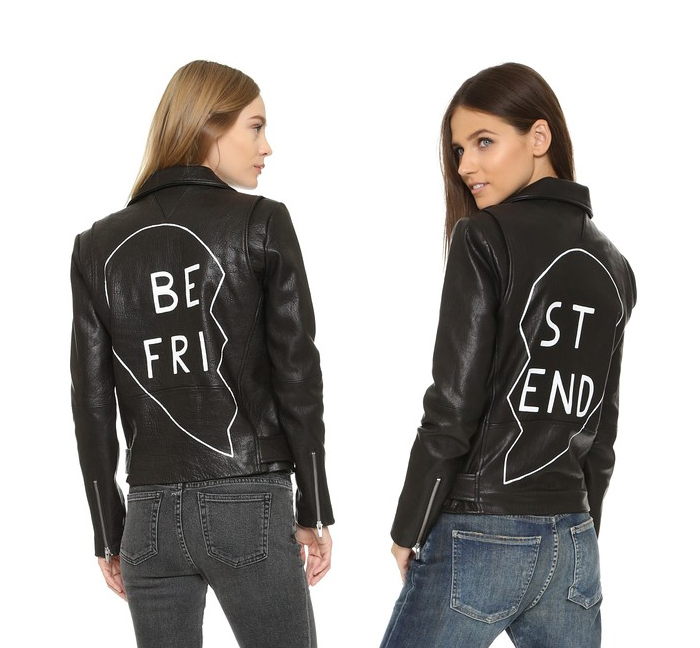 Have you seen these fun "Best Friend" jackets. You buy one for you and one for your best friend. Lastly, if you liked this dress - it is back in stock. I just got a pair of espadrilles and am eyeing anther. They are so fun! Loving those red espadrilles! So fun! I need that lace up top from H&M. I wish they shipped to Canada, ugh. Your save outfit is identical to the splurge one! I love that white, lace up top! I love these save and splurge type of posts! 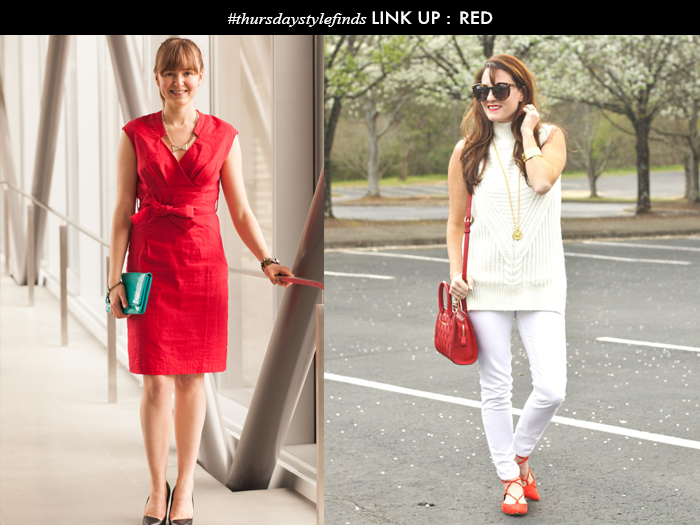 I have been wanting to get a red hand bag or clutch lately, love these picks! Love a lace-up top! So fun! Thanks for hosting a great link-up, lady! Such a great recreation! I love the lace up sweaters! That red bag is just killer. I love the shape and size of it! Oh dear, now I'm going to have to buy some red wedges to go with my red bag for summer! Love it all! Seriously I need that lace up top and red wedges!! Great inspiration board, they do look a lot similar! I love the red! ALthough I feel it's more of a winter colour it's still so fun for summer! Amazing collection, love the shoes most! I have not worn espadrilles for ages. Although those such comfy shoes that let your feet breathe. I love a pop of red in a neutral look. Happy weekend! Hee hee, I know who one of the bloggers is! Thanks so much for featuring us Lisa! 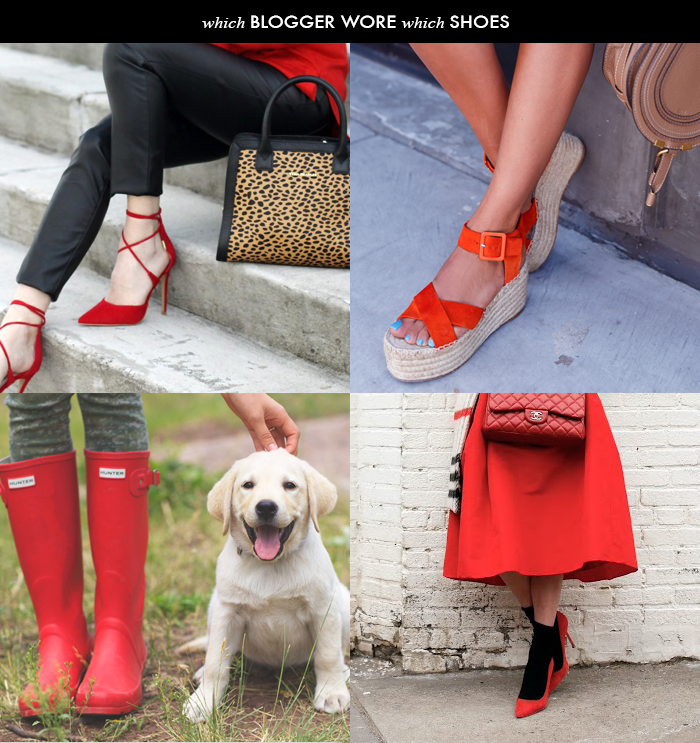 REd shoes are always so fabulous, and I love your picks! Love the lace up top and that you gave us save/spurge options! Red shoes are such a great with any outfit! Love the espadrilles!